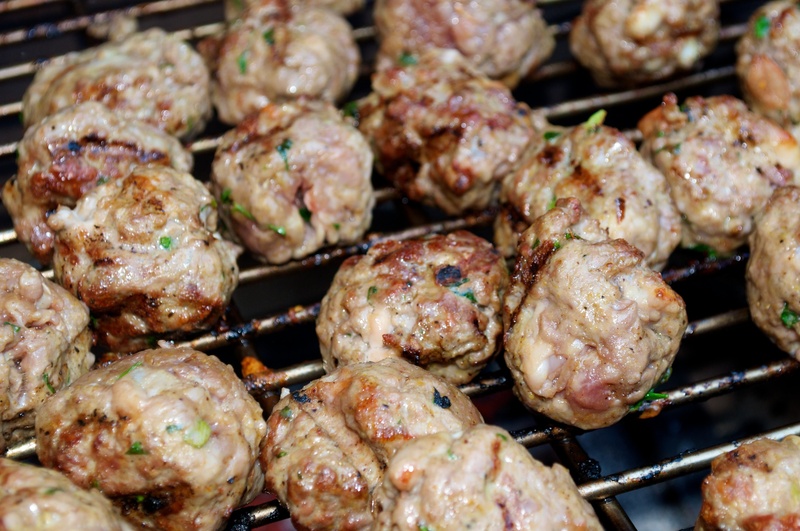 DizzyFest – June 2013 Recipes! 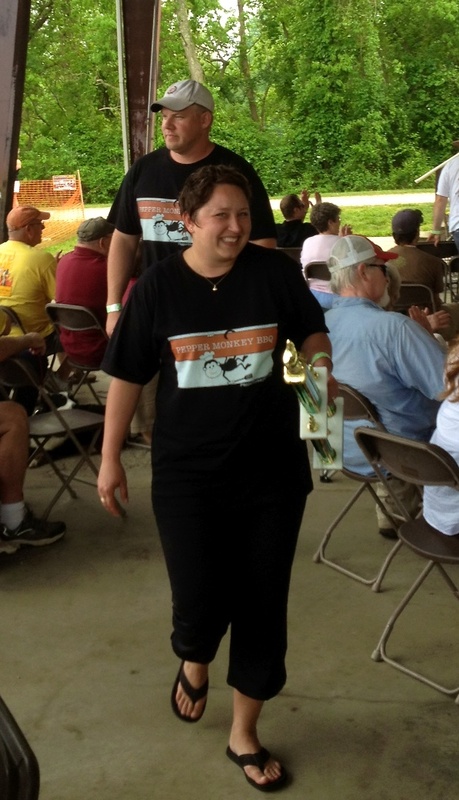 Brian had many responsibilities during DizzyFest, including photobombing Chris Capell! Hard to believe it’s already time for the first DizzyFest of 2013. 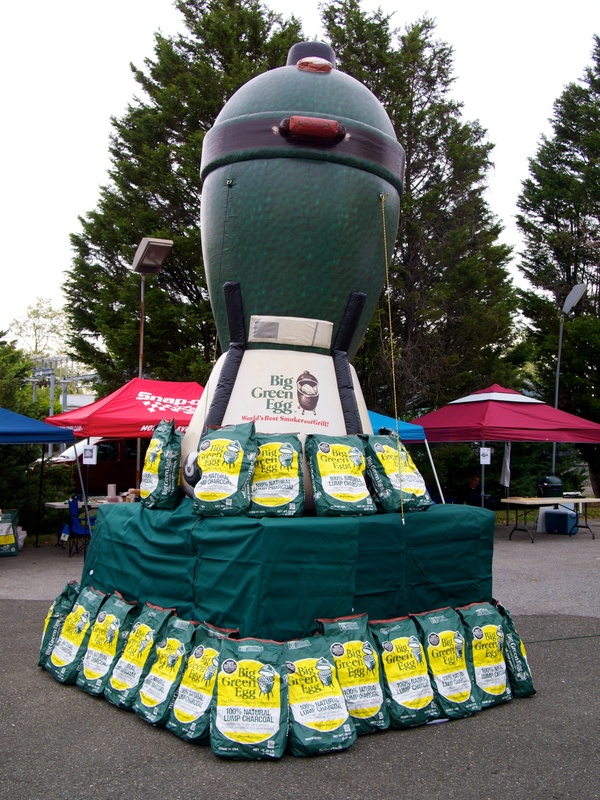 We spent the first three weeks of May competing in KCBS BBQ competitions and with the help of our Dizzy Pig sponsorship we finished in the top ten in two of those three competitions. 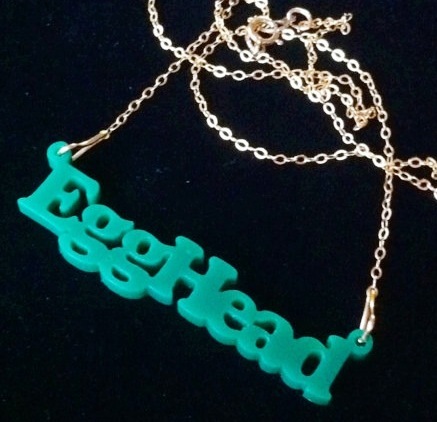 There’s no better way to relax after a grueling month than an eggest and Chris and the Dizzy Pig crew put on one of the best eggfests in the area! 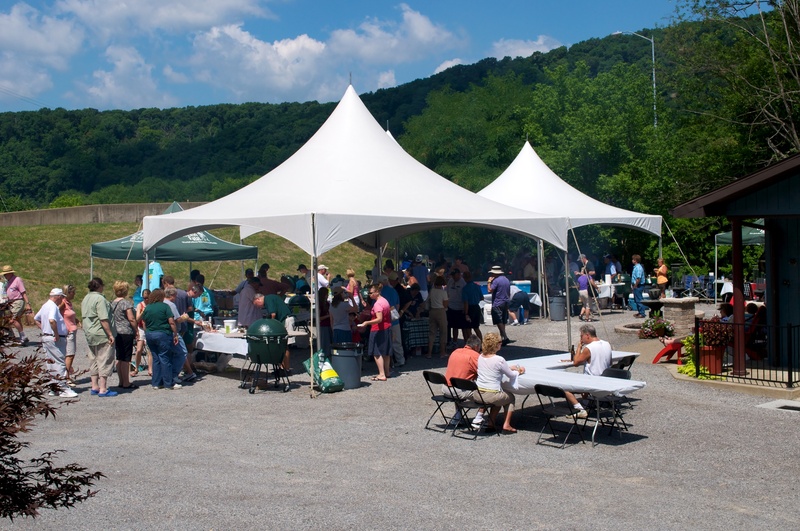 We had a great time, enjoyed some great weather, and yes, we’ve already signed up to cook for DizzyFest5! Thanks to the entire crew for putting on a great event. 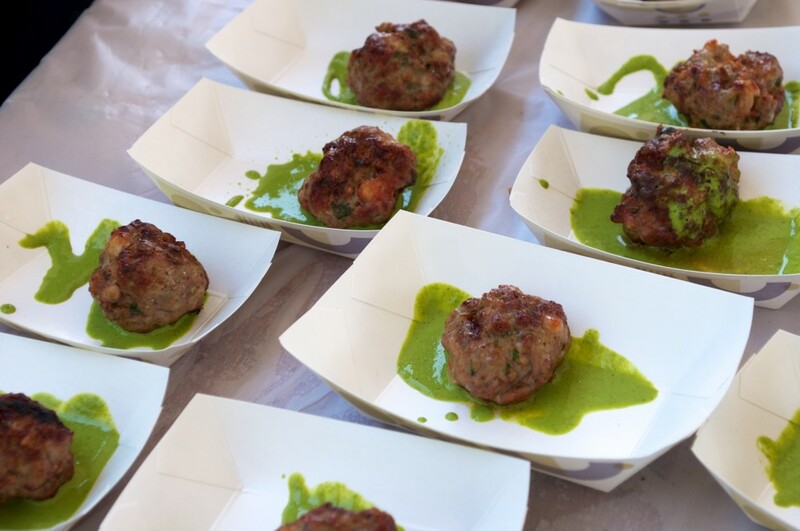 We had many requests for our recipes and instead of handing out recipe cards, we promised to post the recipe and cooking instructions for the dishes we served up at DizzyFest. This way they can be accessed at any time, and if you use the recipe and find a way to improve it, you can interact with us and everyone else by posting what you’ve done! If you know Erin at all, recipes are all in her head and rarely are actually measured or portioned out. Because of this, we will mostly just list ingredients and when possible try to approximate a measurement. Keep in mind it’s all done to taste and you should be tasting as you go! 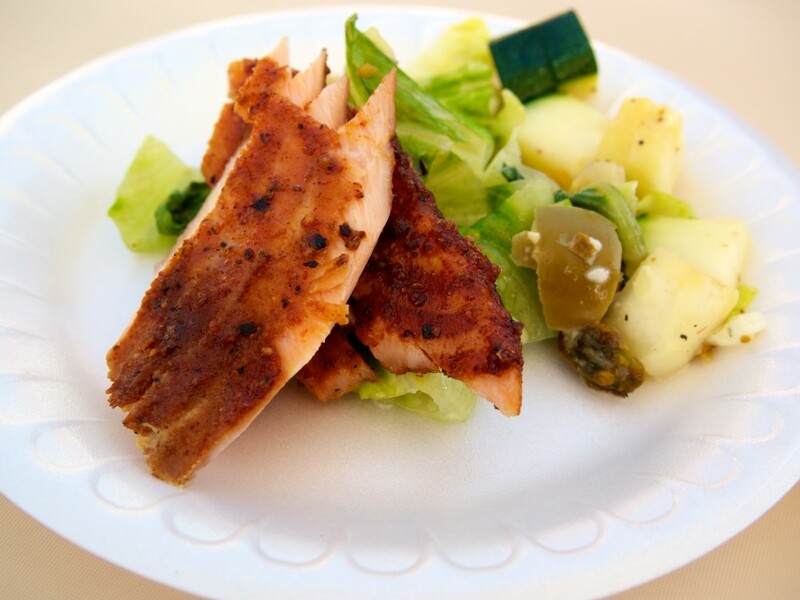 Take one salmon filet and marinade overnight in an asian style marinade (recipe below). Set up your egg to cook indirect at approximately 275 degrees. We use alder chips over the coals for a gentle smoke flavor. Dust the filet with a heavy coat of Dizzy Pig’s Raging River followed by a lighter coat of Dizzy Pig’s Pineapple Head rub. Let sit for 10 minutes before cooking. Place the salmon in the smoker and cook to an internal temperature of 138. If you like it more firm, cook to 145. This should take approximately 45 minutes. For the salad, set up an egg for direct cooking at about 400 degrees. 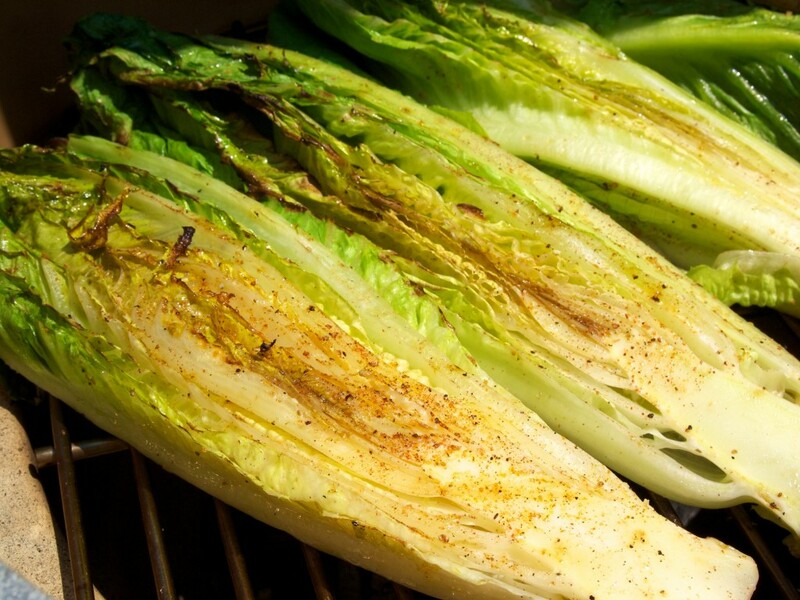 Cut romaine hearts in half lengthwise, drizzle with olive oil and lightly dust with Dizzy Pig’s Shakin’ the Tree. 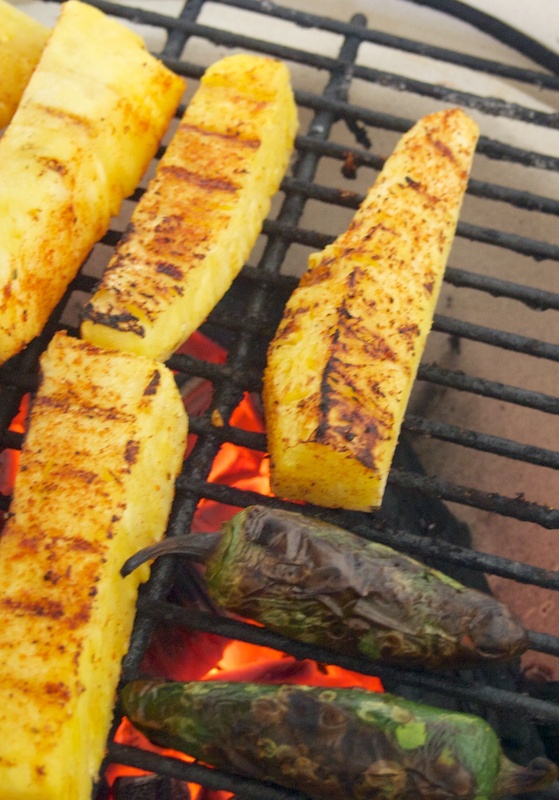 Place on grate to char each side. This should only take a couple of minutes per side, just keep an eye on it. Slice zucchini and treat it the same as the romaine using the oil, same rub, and char for a few minutes on each side over direct heat. We like to throw a few green onions directly on the grate at the same time as the zucchini just to give it a little char as well. 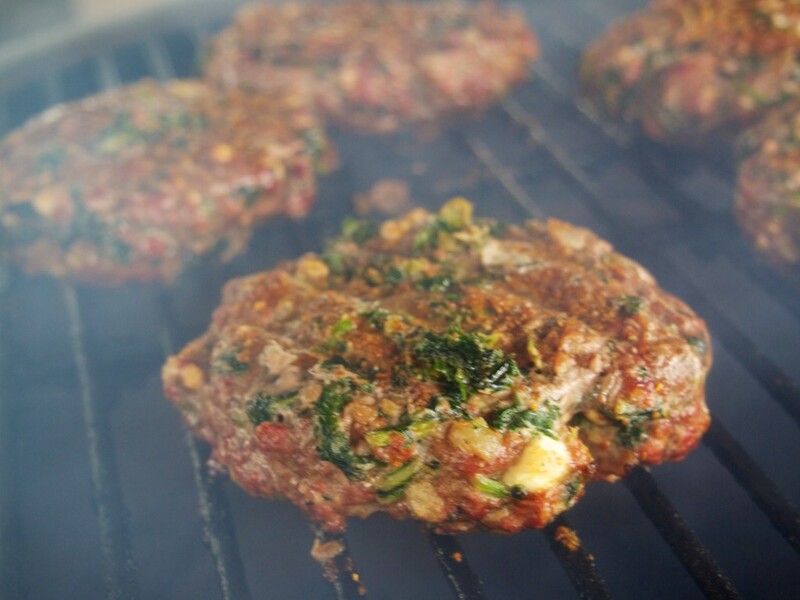 Chop grilled ingredients and toss with salad ingredients and toppings of your choice. We used Erin’s favorite green olive antipasto from Costco: Mezzetta Italian Olive Antipasto, crumbled gorgonzola, and our new favorite salad ingredient… roasted pistachios. The dressing we used was really just a mixture of a pre-made caesar dressing from Costco, mixed with the juice from the olive mixture and a little bit of walnut oil and jalepeno olive oil. You can use whichever ingredients and dressing you prefer. Have fun with it! We us a true 12″ paella pan as it really does a good job of cooking evenly over direct heat. Set up your egg for a temperature of about 325 then put your pan on to pre-heat. The goal during this cooking process it to just keep things simmering and adding ingredients as you go. Start by cooking chicken in a little olive oil until cooked through. Add chopped cauliflower and a generous amount (about a palm full) of Dizzy Pig Curry-ish seasoning. Add rice or grain mixture of your choice, we used a Mediterranean grain blend, again from Costco, with enough water or chicken stock to cover all the ingredients. Let simmer and add liquid if it begins to become to dry before your rice or grains are cooked. Stir as needed to keep the bottom from getting overdone. This process is similar to cooking a risotto. 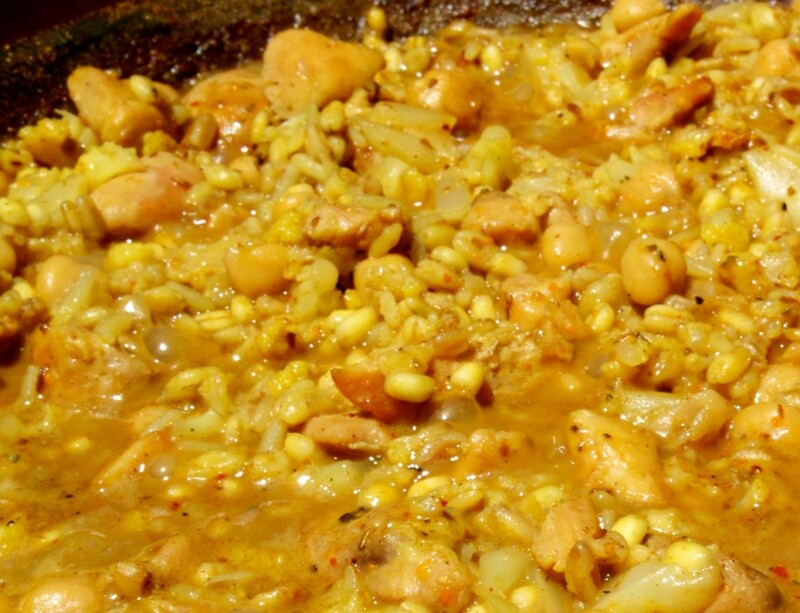 Once your grains are close to finished, add 1/2 can of garbanzo beans and continue simmering. Once the grains are finished and most of the liquid has been absorbed, add 1/2 can of coconut milk and continue cooking approximately 3 more minutes until the coconut milk has mixed in and had chance to be absorbed. Taste as you go and add season salt and/or Curry-ish if you think it needs it. A quick zest of lemon would be great right at the end. Hmmm… we’ll have to try that! Again, this is approximate. Be sure to taste as you go and make changes if necessary. A few people asked us about our PepperMonkey Lamb meatballs that we had cooked at other EggFests. 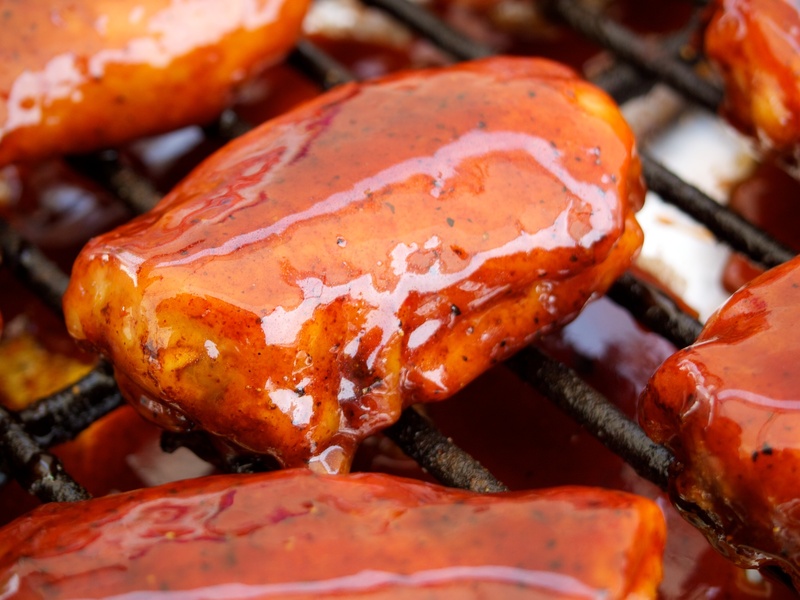 We were fortunate this year to have the recipe published in Paul Kirks newest book, “America’s Best BBQ – Homestyle: What the Champions Cook in Their Backyards.” After the book was published, Epicurious selected our recipe as their recipe of the day. 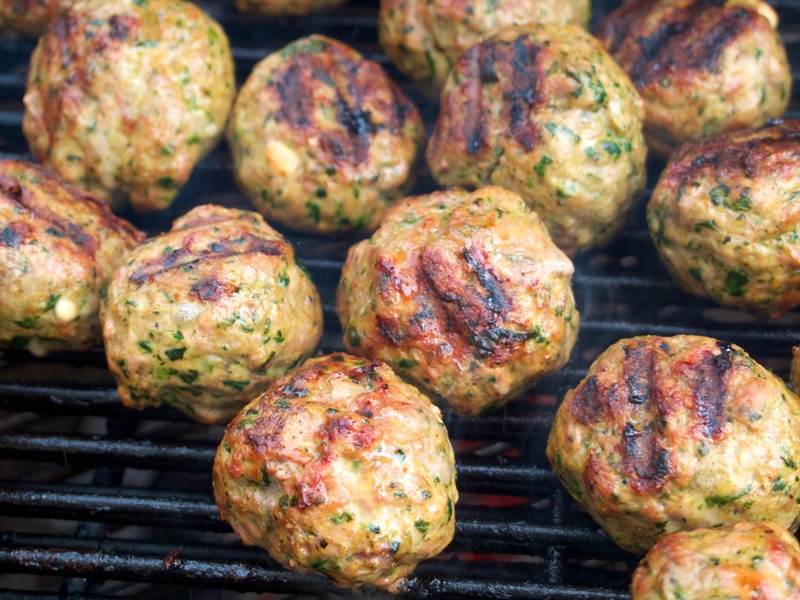 Click here if you’d like to view this wonderful lamb recipe! Season Opener … 6th overall! What turned out to be 1st place chicken is sauced and resting on the grate. 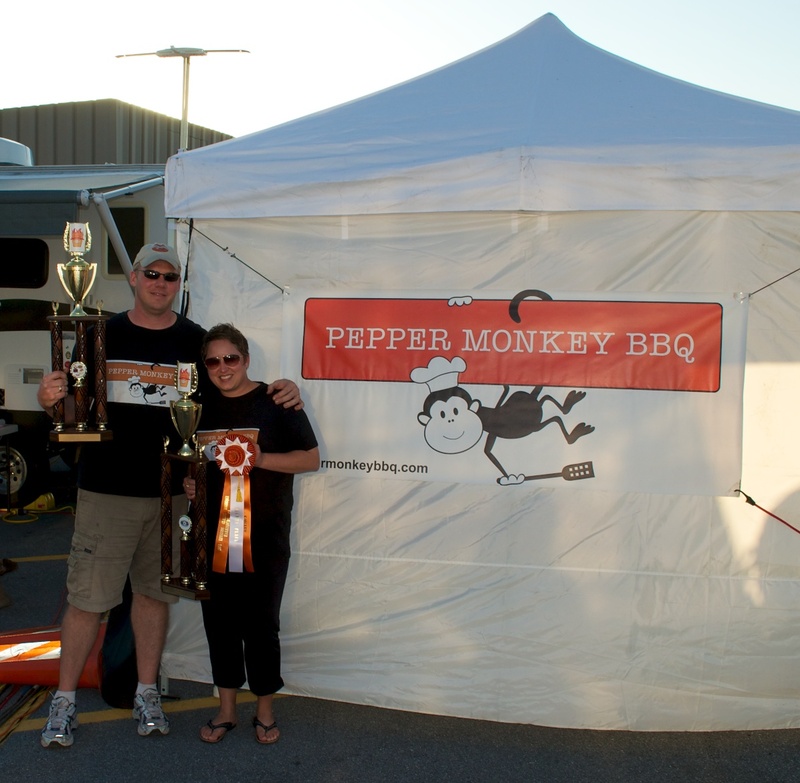 We warmed up 2012 with the Go Naked competition in April, but the Naptown BarBAYq was our first full KCBS competition of the year, and for the most part, we were happy with how things turned out. 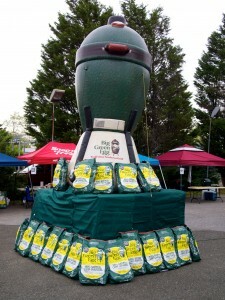 We missed the first Naptown BarBAYq in 2011 because we were at the Waldorf, MD Eggfest. This year we were eager for a competition and Annapolis was just too close to home to pass up. Don and his crew did a fantastic job of meeting all the needs of the competition teams. Seeing how this event was run and knowing it was only the second year (and the first year at the new location) we are certain to come back next year. Friday night we entered two ancillary categories, but we never heard our named called for chef’s choice or for the seafood category. 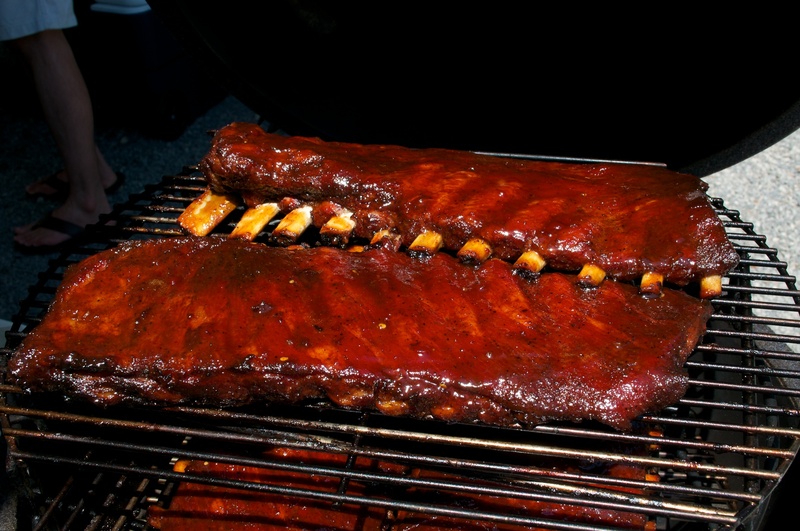 It seems as though beating 3Eyz BBQ at any ancillary category will be the challenge of 2012. 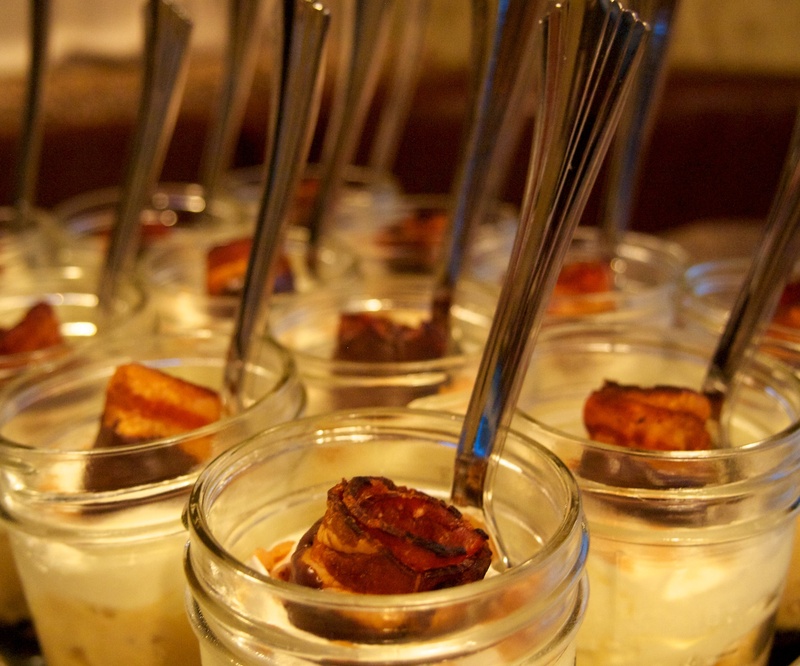 We chose a dessert consisting of a peanut butter pie filling served over a brownie and topped with a chocolate dipped bacon coil ….. And for the record, it was very tasty! The chocolate dipped bacon coil really topped off our peanut butter pie dessert! We were fortunate to set up camp next to a first time team … I believe the team name was “We Beat Your Meat” (sorry guys if I have that wrong). I say fortunate because we enjoy helping out new teams any way we can. 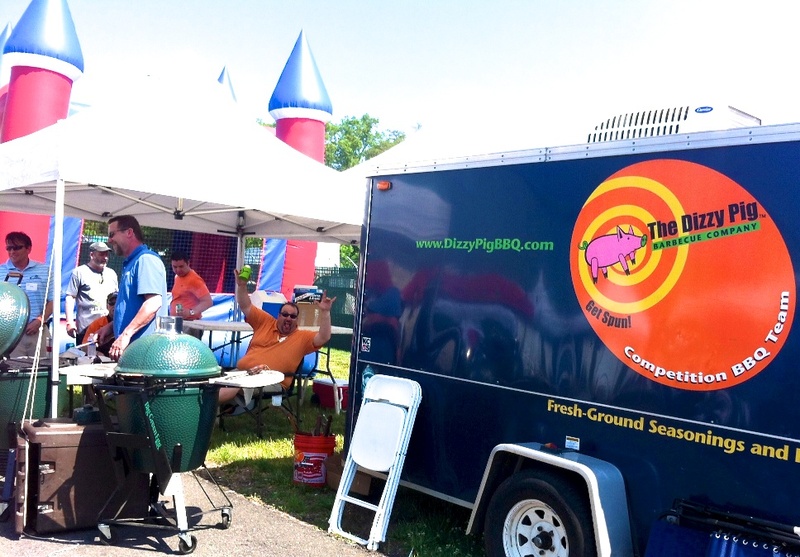 We realize we are far from veteran status, but we always look back to how nice Chris Capell and his Dizzy Pig crew treated us when we set up next to them for our first competition in 2010. After that experience, we vowed to always assist a new team any chance we got and ensure they are treated the way we were when we were rookies. Ryan, the chief cook, led the team to an early call Friday night when they got 2nd overall in the ancillary categories. Well done !!! There were a lot of seasoned cooks at this event and these guys pulled in a nice check before the true competition even started! After just a couple hours of sleep, the alarm sounded in the wee hours on Saturday morning, reminding us it was competition day. The eggs were soon fired up and closely monitored. Our best cooks have been using no electronic temp controllers or fans … so we decided to start this year out the same way and cook using nothing more than thermometers and vent adjustments. Overall, the cook went really well for the first of the year. We waited to trim the brisket at the competition site and realized it was smaller and more thin than normal and we weren’t able to compensate enough during the cook. Our brisket was early and had to rest longer than prefered which resulted in a poor brisket score. The ribs were a different story; after a history of having them come out slightly over cooked, this time they were slightly under. We had one rack that was just right, and should have boxed only that rack; but we decided to take a few others to fill the box and in hind sight, that may have affected our scores. Pork and chicken landed us top ten calls; 6th in pork, and 1st in chicken! We weren’t 100% confident in our chicken, but that has been a strong category for us and Erin forecasted early on that it would be our best of the day. All smiles after a 1st place chicken call! The Annapolis BarBAYq turned out to be a success for us. With two calls and a 6th place overall, we are motivated to head to Delaware and improve on everything we did this weekend. Thanks to Don and his crew for all the hard work they put into the event. This is one that everyone should consider adding to their schedule if it isn’t there already. See you there next year!